On Sunday the 2nd of September over 20,000 runners are set to take to the streets of Glasgow to take part in the Great Scottish Run. If you’ve entered, or even if you’re supporting someone who’s entered you might like to read the following top 10 tips from Running Coach Lorn Pearson. (If you like what you see, you can like Lorn’s Facebook Page here). 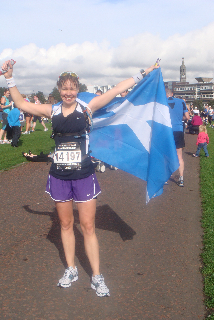 ‘I first did the Great Scottish Run half marathon in 2010, dressed as Supergirl. And last year I ran the Great Scottish Run 10k, then ran up to the start of the Half Marathon and did that too. It’s a great event and one I keep going back to year after year. 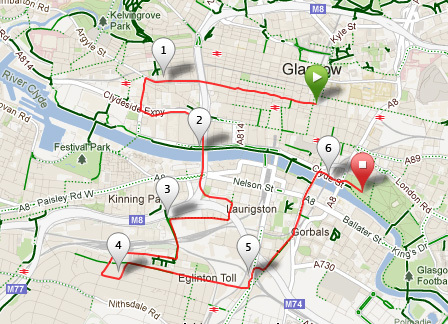 I love running around the Glasgow streets and parks I know so well (the course even goes past my front door!) and as ever the event is well organised and a great experience. Here are my top 10 tips which will hopefully help you complete and enjoy the Great Scottish Run, whatever distance you’re running on Sunday. The 10k is a very popular distance for all types of runners. It’s a good step up for people who have succeeded in running 5k and it’s a good distance for experienced runners too. The distance that a 10k covers is far enough to test any runner, yet short enough to be doable in a satisfyingly quick time, even if you’re new to running. Running 10k is a challenge that anyone can do, all it takes is a base level of fitness, a positive attitude and some training to get you across that finish line. I’ve run many distances right up to ultramarathons, and the half marathon is one of my favourite distances to run. long enough to be a challenge but not as long or as daunting as marathon. 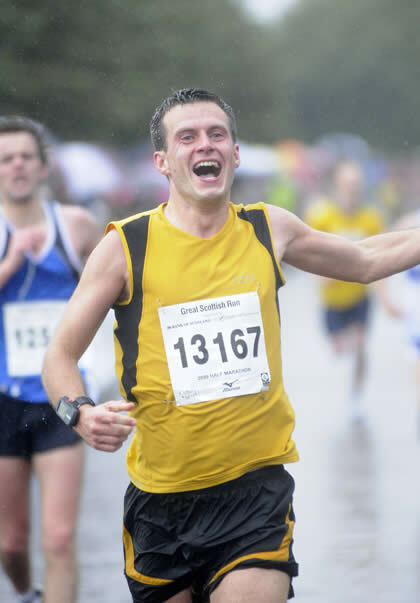 If you can run a 10k non stop, you can probably run a half marathon – all it takes is a bit of dedication, training to increase your long runs, a bit of confidence and a little more positivity. When running distances, be it 10k, or a half marathon, it can be a good idea to split them down into smaller chunks so they seem less daunting. So instead of 10k, think 2k, 2k, 2k, 2k and finally… 2k! And for a half marathon think of small runs of: 6 miles, 4 miles, 3.1 miles. Tick each one off as you complete it and you should gain confidence and belief that you can do it as you go on and get closer and closer to that finish line. You get a copy of the routes in the information leaflet in your race pack, but one thing it doesn’t show you is where the hills are – or even if there are any hills. I’ve done both routes myself, in training and in the event, so I know where all the up and down hills are. Going onto the Kingston Bridge: take your mind off it by thinking how cool it is to be going over it! Up to mile 3 there’s a small gradual climb up Sheilds Road and St Andrew’s Drive. At mile 4: there’s a steady ongoing hill from mile 4-5: look down and tell yourself it’s flat! 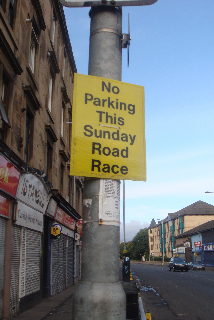 At the start: St Vincent Street: you probably won’t notice this much as you’ll be in a sea of runners. Mile 4: Paisley Road West: a slow gradual hill which you won’t really notice up to mile 5. Mile 7-9: Pollok Park: after you enter Pollok Park there’s a bit of a climb (0.25 miles) then a down hill and around the corner in Pollok Park. Then there’s a downhill before you turn left along past the cows. After the cows you take another left up a short steep hill towards the Burrell Collection. Mile 10: a steady slight hill up past Crossmyloof. 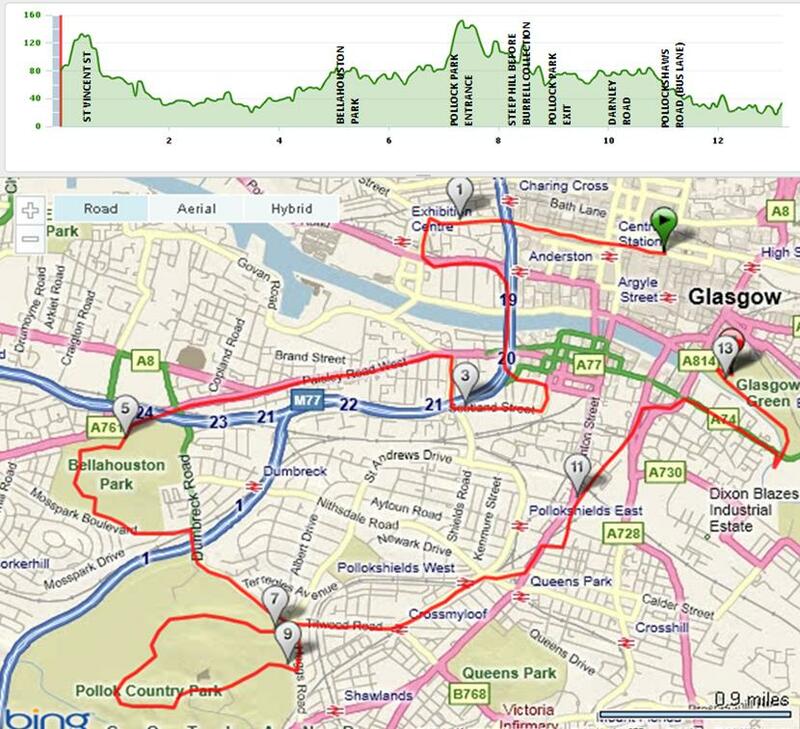 Then after that it’s more or less a nice steady downhill towards the Clyde with a right past the Gorbals and into Glasgow Green. I’ve done some posts in the past with advice on how best to tackle uphills and downhills. When you’re running and event it’s a must to check the weather before hand to make sure you wear the right clothes and prepare for the conditions. If you compare the weather to the previous few days, it can help you make a good decision about what the conditions are going to be like and what you should wear on the day. If it’s sunny, make sure you put on suncream and maybe wear a cap and some sunglasses to shield your eyes from the sun. 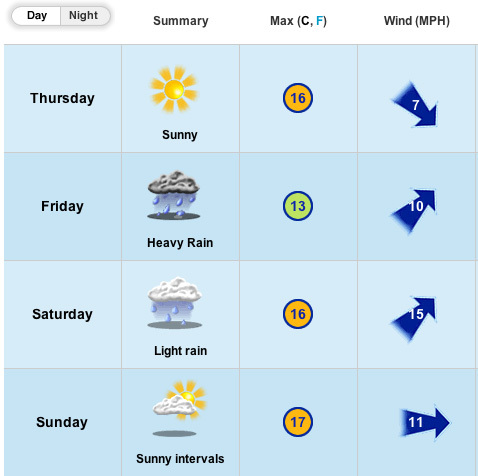 If it’s raining, you will get wet so I wouldn’t bother with a jacket, especially as it’s forecast to be a warm 17C-19C! A tip if you are hot when running is to either fill your cap with water, or pour water over your head and down your neck as you run. I’ll be wearing shorts and my race vest, along with a big Saltire cape which I’ve worn for my past three half marathons I’ve run. As for trainers, it’s a good idea to wear the ones you’ve trained in, and don’t run in new trainers incase sore feet ruin the event for you! Wear what’s comfortable for you and what you’ve been training in. There are changing and drop bag facilites at the finish in Glasgow Green which is a short walk from the start in George Square. You could wear a black bin bag to keep warm at the start, or an old top which you’re ok to throw away just before the race starts. 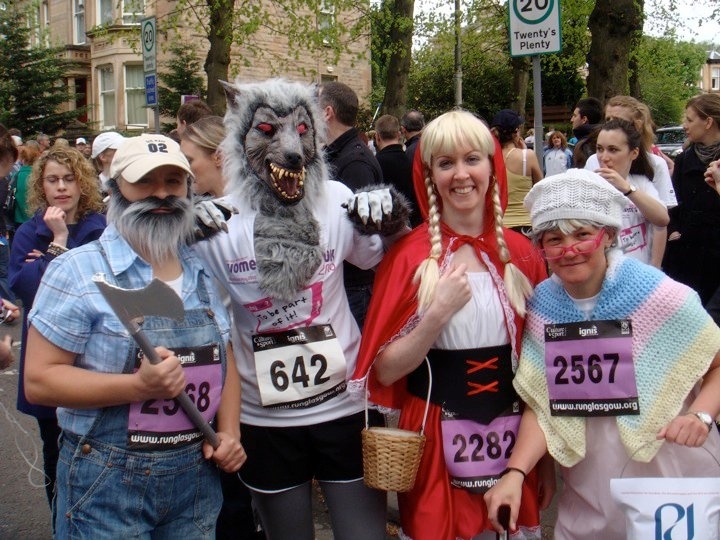 If you fancy a laugh, you could add some fun into the Great Scottish Run by dressing up like I’ve done in the past. It takes the pressure off and makes the whole thing that little more special. And if you want to get cheered on by supporters – why not put your name on your t-shirt? Every bit of encouragement helps, especially in the last mile or so. If you’re not sure how to pace your run, look at some of your training runs and find out what the average pace per mile was for them. Divide the number of minutes you ran for by the distance and you’ll get your minute mile pace. Or you could use The Runners World Race Time Predictor to predict your race time, and get a race band on the Runners World Pace Band Generator here. This year there are also pacers at the Great Scottish Runs. So if you have a realistic time in mind, find a pacer and try to stick with them (or overtake them!) to get your goal, achieve great things and maybe smash your PB! 1.55mins (to get sub 2 hours). Pacers will run the distance at the time allocated to them, and they should run a steady evenly paced speed. I think the most important thing about pacing is to make sure that you don’t go out too fast, especially on a longer distance like the half marathon. Be conservative with your pace at the start (especially because you’ll be going up St Vincent Street in the first mile) and try to enjoy yourself rather than push yourself so hard that you don’t enjoy it. I’ve also done a Q&A here which might help. If you’re running the 10k, the chances are you won’t need any sports drinks or energy, but some water might help if you are thirsty. There are two water stations on the 10k route: one at 5k in (Scotland Street) and the other at 7k in (Maxwell Drive). For the half marathon, I’d suggest you take on water when you need it and also take some form of energy. I usually use energy gels and take one around mile 5 and one at mile 10, but everyone is different. If you haven’t used them before in training, it’s not a good idea to try new energy gels or drinks on the day as it’s best to stick to what you’ve trained with. However if you are using energy gels, I recommend holding one in your hand for 10-20 minutes before you take it to make it more fluid like and easy to take when you do gulp it down. Some people need to take gels with water and some people are quite happy just taking on board water for their runs. Do what’s right for you. One of the most important things that I’ve learned about running is that you have to be able to enjoy yourself to keep coming back for more. If running is hard and you hate it… try to take the pressure off a bit. Slow your pace down and try to enjoy yourself and the experience of running in such a great and amazing event. Be realistic and flexible about any time goals you set yourself, run with a friend or dress up in fancy dress. My favourite events have been the ones where I haven’t put pressure on myself with time goals, but where I’ve dressed up in fancy dress, or run with friends to have a laugh and share the experience with them. You can encourage each other and laugh together later about the funny things you saw and did on the run. Aim to get a good night’s sleep the night before the race (6-10 hours), hydrate well in the week before the event, and make sure you taper and rest adequately. As already mentioned, try to avoid using anything new on race day (gels, trainers, or drinks). Always try to use the gear, energy and hydration types which you’ve used during training and which you are comfortable with. Get up one to two hours before the start times (10k: 9:30, Half Marathon 11:00) and make sure you know how to get to George Square to start. Eat a good breakfast and one which you’ve eaten before training runs to make sure it agrees with you whilst on the run. The organisers suggest you get there around 30 minute before the start time. You may be nervous before the start and it’s a good idea to go to the toilet before the start if you can. Hopefully you’ll have used your weeks of training to get a pre long run routine. After your run, it’s important to keep moving if you can. Continuing to move around at a very low intensity for 5 to 10 minutes after a workout helps remove lactic acid from your muscles and may reduce muscles stiffness. There’s usually a massage tent at the event so you could go and get a good massage after all your hard work if you want. Make sure you get plenty of sleep afterwards and don’t jump right back into training. Take some well earned recovery time after an event, especially if you’re sore for few days after it. See my Top 10 Recovery Tips and my Rest and Recovery page. My goals for the D33: Tick! + some tips! Lorn Pearson is a motivational and enthusiastic Running Coach and runner based in Glasgow. She’s run all distances from short distances to 10ks, half marathons, marathons and ultra marathons and wants to inspire and help others to take up and enjoy running as much as she does. Currently she coaches privately, for Kaizen Active and for Glasgow Life. 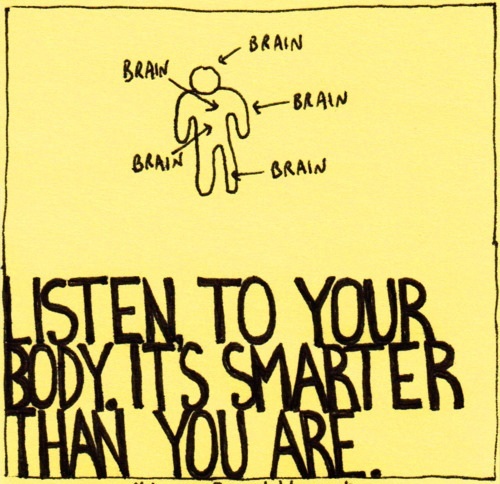 Lorn posts lots of helpful tips and information on her blogLornPearsonTrains.co.uk and on her Facebook Page. Lorn has a very positive, energetic and fun outlook on life and wants to inspire others to be positive, believe in themselves and be the best they can be.